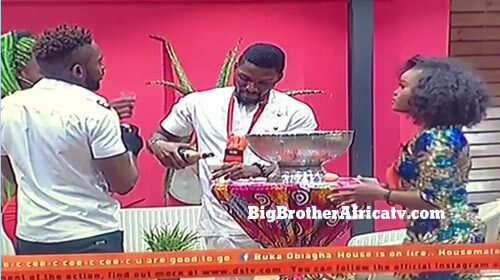 The Big Brother Naija 2018 finalists celebrate reaching the Grand Finale with a few bottles of wine. Emotions were at the peak last night as Nina and Alex couldn’t hold their tears back - overpowering rivers of joy mixed with disbelief and gratitude at having been Saved. They had barely started pouring the bubbly that Cee-C walked back through the doors, to her peers incredulous faces. Cee-C had come back fronting an inscrutable face nonetheless exuding a certain arrogance as she seemed to take delight in the disappointment her return had caused. Expectedly, she retreated to the garden area to savour her fate while talking to her fans and praying for strength.